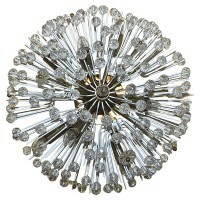 Snowball flush mount ceiling light in the style of Emil Stejnar. Brass finish with white painted florets and socket covers accented with glass flowers and beads. Fixture uses 9 – 40 watt max candelabra base bulbs. Later brass backplates added for US installation. Newly wired. Copyright © 2010 Duo Antiques	. All rights reserved.